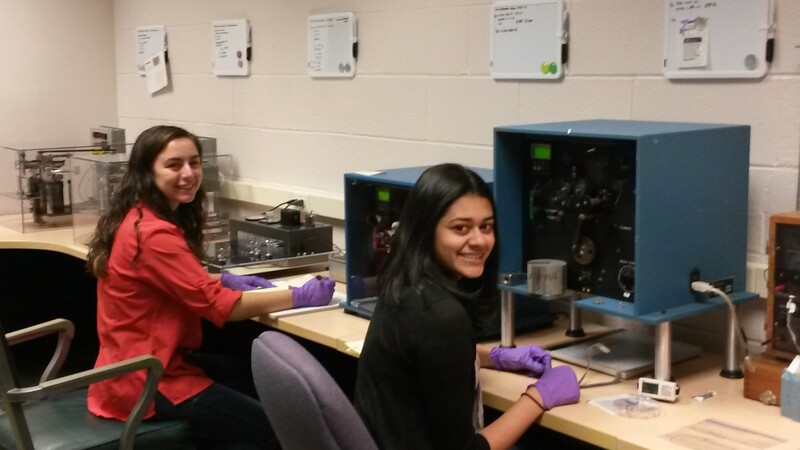 Freshman, Ilana Roth, sophomore, Kimaya Gupte (both pictured above) joined the group in January and will be working with PhD student, Janet Gbur on the mechanical characterization of various wires used in biomedical applications. Kimaya is a BME major from Portland, Oregon and is investigating the flex fatigue behavior of dental arch wires. Ilana is an engineering major from New Jersey and is investigating the rotating bending behavior of fine Nitinol wires. Nicole Corbin also recently joined the group and is a senior Materials Science and Engineering student working with Nitinol sheet for her senior design project. Francesca Fabe, a junior at Beaumont High School, collaborated with PhD student, Janet Gbur on her AP Biology project investigating the fatigue of dental arch wires. 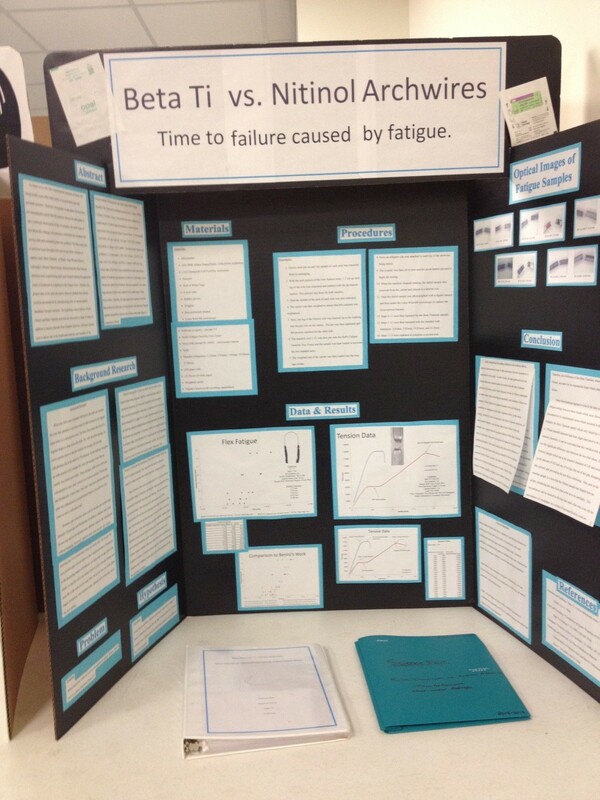 The project, “Beta Titanium vs. Nitinol Archwires: Which material can withstand longer periods of fatigue before failing?” has been accepted into the NEOSF, BEST Medicine, and District V science fairs. Mohsen Seifi, Doctoral Researcher is the recipient of the 2014 ASM International Cleveland Chapter President’s Award. The Cleveland Chapter President’s Award is presented annually ‘to the one person the Chapter Chairman feels contributed the most for the good of the Chapter in promoting the goals and objectives of ASM International’. The Chapter Chairman selects the recipient. 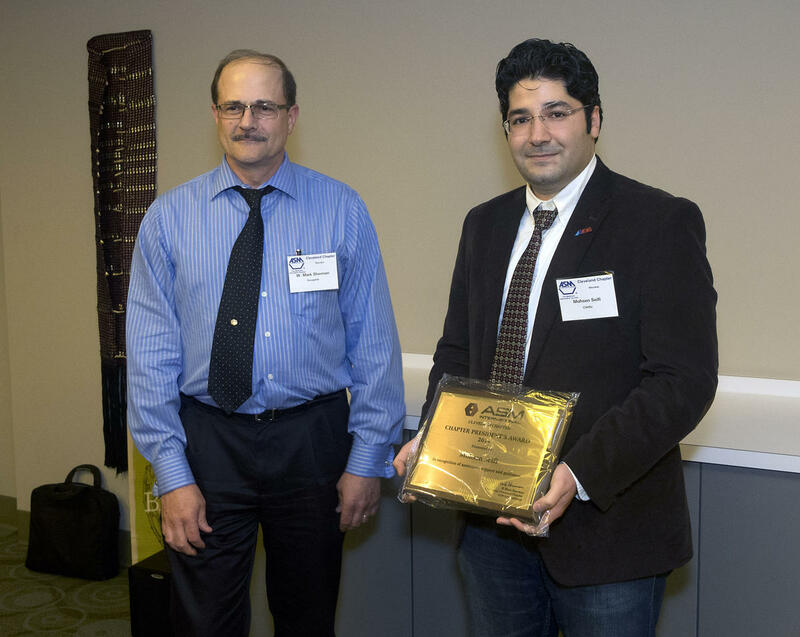 Mohsen accepted his award at the May 2014 ASM International Cleveland Meeting held at ASM International HQ. The details of this award can be found on the ASM Cleveland Website here. Jun Yi, Wei-Hua Wang and Prof. Lewandowski published at paper in Acta Materialia (2015) 87, pp. 1-7, entitled: Sample size and preparation effects on the tensile ductility of Pd-based metallic glass nanowires. Abstract—Glass materials, including metallic glasses (MGs), typically fracture in tension at room temperature in a globally elastic manner. Although homogeneous tensile plasticity and necking of nanoscale MGs have been reported, controversy exists regarding possible contributions from specimen preparation and testing techniques. Here, we show the separate effects of sample size reduction and extrinsic effects on the homogeneous tensile plas- ticity and necking of Pd40Cu30Ni10P20 glassy wires tested at room temperature. An intrinsic transition from catastrophic shear fracture to plasticity and necking was obtained in this glass when its diameter approached the estimated length scale of the shear-band nucleus size (i.e. 500 nm). A further reduction in the wire diameter to 267 nm produced homogeneous flow and complete ductile necking, with a true fracture strain in excess of 2.0. Our theoretical analysis shows that the plasticity of nanoscale MG wires with diameters smaller than a critical length scale is mediated by shear trans- formations catalyzed by local shear dilatation, and the predicted critical length scale for the brittle-to-ductile transition of the glassy wires is con- sistent with our experimental results. Extrinsic effects introduced during sample preparation and/or testing produce entirely different results and are reviewed in the light of previous work. The published paper can be accessed here.